Huangshan (黄山; Huángshān; lit. : Yellow Mountain) is in Anhui Province in China, toward the southern end near the border with Zhejiang. It is on the UNESCO World Heritage List. There is also a Huangshan city to the south and a Huangshan district to the north. 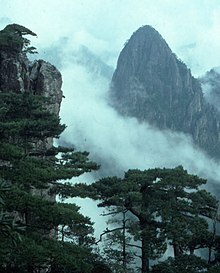 Huangshan is a granite massif consisting of 36 peaks, rising above 1,800 m. Famous throughout Chinese artistic history, Huangshan represents the typical mountain in Chinese paintings. Frequently shrouded in mist, the many peaks appear to float on clouds and have very fanciful names such as 18 Arhats Worshipping the South Sea, Lotus Flower Peak, Celestial Capital, and Paint Brush. Jagged granite peaks clothed in uniquely shaped pine trees create a spectacular landscape of great interest to artists and photographers. The development of walking tracks and cable cars makes this landscape accessible to most active travelers. Over 1,450 kinds of plant are found within the park. The most spectacular tree is the unique Pinus huangshanensis which grows precariously clinging to rock faces. Many of the trees have names such as the Welcoming Guest and the Seeing-off Guest Pines. Carpinus, Cornus, Enkianthus, Fraxinus, Rhododendron and Weigelia are some of the species of flowering tree to be seen. 470 species of animals have been recorded. The most frequently seen ground animals are squirrels, macaques, and small skinks. Can be cold at night (it's 1,800 m above sea level). The upper parts of the mountain freeze periodically in winter, which can make some paths slippery with ice, especially in the morning. The more dangerous paths are generally closed in these conditions, and vendors on the mountain sell cheap snow spikes that attach to your shoes. Over 200 days per year, the top of the mountain is in clouds and all that spectacular scenery is hidden. If there is only partial cloud cover, however, the mountain is utterly spectacular. If you have the flexibility, plan to stay for several days, or adjust the dates of your visit according to the weather forecast. The valleys around the mountain tend to collect clouds overnight, especially after rain or snow, leading to a "cloud sea", one of the mountain's famous scenic highlights. 29.8179118.26791 Huangshan North railway station (黄山北站). The nearest station is Huangshan North railway station, opened in 2015, with high-speed trains to Beijing, Fuzhou, Guangzhou, Nanchang, Qingdao, Shanghai and other cities in eastern China. This station is expected to rapidly become a hub, with lines radiating out in several directions. 29.7248118.31712 Huangshan station (黄山站). In the town of Tunxi (Huangshan City), this station serves sleeper trains arriving from many major cities in eastern China. There is an overnight train from Shanghai via Suzhou and Nanjing that takes about 11 hours, which is longer than a direct bus, but it does save a night at a hotel, so it is a popular option. It arrives around 07:00, giving you all day to visit the mountain. The return trip has similar timing. 29.7322118.25433 Huangshan Tunxi International Airport (黄山屯溪国际机场, TXN IATA). The nearest domestic airport is at Tunxi, about an hour's drive from the base of the mountain. The flight to Shanghai Hongqiao is less than one hour. Taxis from the airport to Laojie in downtown Tunxi should be ¥30 but are notorious for asking much higher prices and refusing to run the meter. If you bargain at the airport be prepared for rejections and delays until all other fellow passengers are gone. Frequent direct buses run from Shanghai and Hangzhou. The buses from Hangzhou run either to Huangshan City (nearly two hours away) or direct to Tangkou at the mountain's tourist distribution center. The buses to Tangkou are less regular, but easy to catch if you phone up the bus station and get a timetable. Buses back from Tangkou leave mid-afternoon, but are closely spaced such that the second bus is usually empty. In these circumstances, the first bus may "break down" in Tunxi until the second bus catches up. An entry fee of ¥230 applies (off-season entry fee is ¥120, e.g. early December), a 50% discount is available for students with IDs and seniors. If you take the tram to the top, it costs ¥80 each way, and you'll need ¥19 each way for the shuttle bus to reach the lifts or trailheads on the south side of the mountain. Prices for food are about twice as high on the top as they are at the bottom. Huangshan City (Tunxi) is not too close to the actual Yellow Mountain. A taxi from the airport to Tangkou is ¥100-200 depending on your negotiating skills. Upon arrival at the train station, airport, or long-distance bus station, a convenient method of transportation is by bus to the 30.0935118.18254 tourist distribution center at Tangkou. The bus ride to Tangkou takes about an hour, and offers great views of rural Anhui Province. There lots of small buses outside Huangshan station, which should cost ¥15-20 for a one-way ticket and leave frequently. From Huangshan North station, walk to the bus terminal to your right when entering the station, where larger, less-frequent tourist buses take you to the mountain. As of 2018 these can fill up hours in advance, the ticket desk may have lineups of 20-30 minutes, and nearly all booking is actually done through a clunky, Chinese-only WeChat plugin. From the town of Tangkou (汤口镇, Tangkouzhen), at the foot of the mountain, a shuttle service operates every 20 minutes to the Hot Springs Area; 30.104118.16545 Yuping Cable Car and 30.1237118.18896 Xinyungu (New Cloud Valley) Cable Car. Tangkou is quite walkable but taxis are available to scenic spots around the foot of the mountain. You cannot go direct to the mountain entrance by taxi: only the National Express buses are allowed into the scenic area. There are trails up the mountain that start near each of the two southern cable cars, but leaving from different bus stops. Lotus peak and Celestial Capital peak are each typically open for five years at a time while the other closes. In 2019, Celestial Capital Peak will open. Less-popular and more-dangerous trails, including Celestial Capital Peak and the trails up from the north and northwest, are normally closed in winter. Mount Huangshan. The main tourist destination is Mount Huangshan. From the Yuping Cable Car/Mercy Light Temple entrance the "Western Steps" lead up for about 14 km over spectacular terrain. Allow 6-7 hours for the ascent. If you are fit and have a good head for heights the steep ascent to Celestial Capital Peak is rewarding. From the Yungu Cable Car carpark the ascent by the "Eastern Steps" is easier, taking as little as 2-3 hours. If you choose to descend by the Eastern Steps you can extend the hike by including the Nine Dragon Waterfall area (Jiulongpu) for an additional charge. The paths are all stone steps and it can make your legs rubbery after a while. A long descend is not that much easier than a descent. Huangshan is most famous for its sun rise and sea of cloud at dawn. However, all these wonders are subject to weather condition. In off-seasons, Mount Huangshan can be extremely foggy in the morning. Approach your hotel or hostel counters for some travel tips in this area, normally they are very experienced locals. Zhuhai (Buses do not run at night though, so if you want to go after 5PM, get a cab for ¥100-200.). Do not miss this nearby gorgeous valley covered with a bamboo forest. Some very nice restaurants and rustic inns you can stay in (preferable to Tunxi). ¥30. Hiking. There are four trails up the mountain: two from the south, one from the north, and one from the northwest. From the south, the more scenic "western steps" start from 30.1080917118.16777221 Ciguang Pavilion (慈光阁, Mercy Light Temple), past the Yuping cablecar, while the 30.122118.18782 "eastern steps" start just below the Yungu cablecar. In the north, a trail starts from the base of the Taiping cableway, at the Songgu Forest (松谷禅林) entrance. The far more obscure but very scenic route from the 30.1348118.12463 northwest entrance via the Fairy Bridge starts at the end of a small local road. The northwest entrance has no bus service and no taxis, is not near any village, and its parking lot is usually completely empty, so ascending via this route requires a taxi and descending requires planning your transportation in advance. It is also sometimes closed in winter. Once on the top of the mountain it is possible to do a few walks. Highly recommend is the walk through the West Sea, for its stunning scenery. This area is also accessible by a funicular railway from the top (¥90). The connection between the Fairy Bridge and West Sea is closed (2018). Note that the trails on the mountain are generally industrial-scale stone or concrete walkways, wide and flat, with railings, often lighting, and a crew of workers to clear off snow, garbage, and leaves. This is not a trek through the wilderness. One of the famous attractions at Huangshan is its hot springs, located above Tangkou. An English-language map is available in Tangkou. Many local couples buy padlocks and inscribe their names on them, then lock them to various places on top of the mountain. Others buy medals commemorating their successful summit of the peak. In Tunxi, the most cited tourist destination is Laojie (old street with lots of souvenir shopping). This street is over-commercialized and has little to offer over the more authentic ancient towns nearby (Hongcun, Xidi, both on the UNESCO World Heritage list, and others). But it is near the airport and train station, and can be entertaining if you need to kill time before leaving town. The Laojie is a great place for buying high quality red, black and green tea at reasonable prices. Also worth a try is the tea tofu. Food options are limited on the mountain. There are (expensive) restaurants in all the hotels but it is hard for a solo traveller to find cheap food. There are several small grocery stores selling snacks & drinks. Stinky tofu of a particularly stinky variety seems to be popular as well. On top of the mountain in peak season, water was ¥6-10, beer ¥10, meat sticks 3 for ¥10, instant noodles ¥10, cucumbers 2 for ¥6. Laojie Diyilou (老街第一楼), 249 Laojie (老街249号). Bright, tastefully decorated restaurant with examples of the food so you know what you are ordering. Not high cuisine, but not bad and predictable! ¥50-70 per person. Take plenty of water as the price rises steeply on the mountain (up to ¥10 per 600 ml bottle). Local beer, such as Huangshan Beer (黄山啤酒), costs ¥10-20. On Huangshan, most tourists choose to stay overnight at one of several hotels in the Beihai region of the mountain to watch the sunset and sunrise. All hotels on the mountain are extremely expensive (a bed in a shared dorm is likely to cost more than ¥300/night), and note that several close in winter. In Tangkou there are a lot of cheap hotels available for around ¥80. And there are also some options in Tunxi. Note that there is a well-staffed police station on the mountain, and if you try to check into a hotel there without all your identity documents perfectly in order, you should expect to spend several hours enjoying that police station's hospitality while you explain yourself. 30.144118.16551 Beihai Hotel (北海宾馆). Expensive hotel on top of the mountain, central to many of the sights and convenient for sunrise. Doubles ¥700-9700, dorms may exist at the ~¥300 level..
30.1454118.16512 Shilin Hotel (狮林大酒店). Popular with photographers, and practically covered in spectacular photos of the mountain. ¥900-3,000 for doubles, ¥200-300 for dorms. Huangshan International Youth Hostel, Tangkou. Their food is not very good, but the rooms are cheap and clean with warm water and western toilets. They arrange various tours which are generally good. From ¥100 to ¥300 for a private room in peak season. Watch out for ice in winter, and do not make eye contact with the monkeys. Hongcun (Buses do not run at night though, so if you want to go after 5PM, get a cab for ¥100-200.). Water village. Hongcun is slightly prettier than Xidi, but much more crowded; if pressed for time, you do not need to see both villages. Some very nice restaurants and rustic inns you can stay in (preferable to Tunxi). ¥80. Xidi (Buses do not run at night though, so if you want to go after 5PM, get a cab for ¥100-200.). Water village. Some very nice restaurants and rustic inns you can stay in (preferable to Tunxi). ¥80. This park travel guide to Huangshan is a usable article. It has information about the park, for getting in, about a few attractions, and about accommodations in the park. An adventurous person could use this article, but please feel free to improve it by editing the page.